I had the opportunity, through Tyndale Blog Network, to read and review Bees in the Butterfly Garden by Maureen Lang. Raised in an exclusive boarding school among Fifth Avenue’s finest, Meg Davenport has all she’s ever needed . . . but none of the things she’s wanted most, like family, or dreams of a future that includes anything other than finding a suitable match. So when her distant father dies, she seizes the chance to throw etiquette aside and do as she pleases. Especially when she learns that John Davenport wasn’t the wealthy businessman she thought, but one of the Gilded Age’s most talented thieves. Poised to lead those loyal to Meg’s father, Ian Maguire knows the last thing his mentor would have wanted is for his beloved daughter to follow in his footsteps. Yet Meg is determined, and her connections to one of New York’s wealthiest families could help Ian pull off his biggest heist yet. But are they both in over their heads? And in trying to gain everything, will they end up losing it all? I have read several of Maureen Lang’s previous books and really enjoyed them. 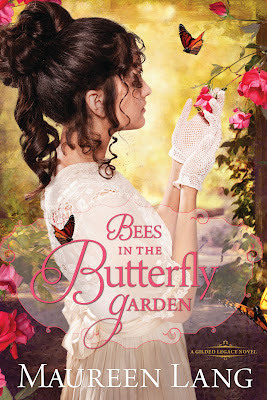 I was excited to get my hands on Bees in the Butterfly Garden, especially because she strayed from her war subject with a turn of the century tale of thievery. I loved the title. I loved the cover. I loved the last third of the book. Somehow, I felt like I was plodding through the first two-thirds of the book. I wanted it to move faster...but, this could very well be because I have been extremely busy the last 3 weeks. So busy, that my read and relax time was pretty non-existent. When I had a chance to open the book, my tired eyes never got farther than a few paragraphs. Not my normal half-a-book-a-night reading. This disruption lent itself to some slow reading, and made it difficult to feel the flow of the story or connection to the characters. However, I persevered, and the last third made up for the slow start. At first, I felt that Meg’s desire to forget all she knew of right, wrong, and proper high society etiquette and turn to a life of crime seemed pretty unrealistic. And then I had to keep reminding myself that we’re all, as the Bible says, corrupt. Totally depraved. Any one of us, no matter how good we seem, could easily fall into a life of crime. It was also a great example of what one will do out of love, whether real or the desire of it - bad, in Meg’s case; and good, in Ian’s case. I loved the Pembertons. (Well, Evie was another good example of depravity - ha! What a rascal!) I loved the family’s method of deciding punishment. Each wronged party gets a vote: mercy, grace, or justice. I thought that approach would be a great teaching tool for my own children! So, Bees in the Butterfly Garden’s ending -and overall story- was good, although the journey to get there was a bit tedious for me. You can read the first chapter HERE. Thank you to Maureen and Tyndale Blog Network for sending me a copy to read and review!